The foreign ministry says the United Nations nuclear watchdog, the IAEA, has “full supervision” of the operation. The French government has condemned the move as a “new provocation”. France and other Western powers fear that Iran’s nuclear programme is aimed at developing nuclear weapons. Iran says its programme is for civilian use. Enriched uranium can be used for civilian nuclear purposes, but also to build atomic bombs. Tehran insists that it is refining uranium for electricity generation and medical applications. “By installing the new centrifuges progress is being made with more speed and better quality,” said Iran’s foreign ministry spokesman Ramin Mehmanparast. He said the move showed Iran’s success in pursuing its “peaceful nuclear activity”, but did not say where the new generation of centrifuges would be installed, or provide details on the speed or capability of the machines. France was quick to condemn the announcement. “Iran is engaging in a new provocation by announcing the imminent installation of next-generation centrifuges,” the French foreign ministry said in a statement. “[It] clearly confirms the suspicions of the IAEA and of the international community about the finality of a programme with no credible civilian application,” the statement said. 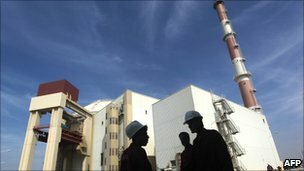 Diplomatic efforts to find a solution to Iran’s nuclear dispute have stalled, after talks between Iran and six world powers broke down in December last year. “Iran must suspend its sensitive activities and create the conditions for reopening talks,” France said. The country is subject to four rounds of UN Security Council sanctions over its refusal to halt uranium enrichment. Last month, the British government accused Iran of testing missiles capable of carrying a nuclear warhead, in contravention of a UN resolution. The Iranians openly test-fired 14 surface-to-surface missiles with a range of 2,000km (1,250 miles) as part of a 10-day programme of military exercises. Its foreign ministry said none of these missiles had nuclear capability.